We went out to Whitley Bay to buy an overlocker from the famous sewing centre, Britain’s largest retailer of sewing machines, it seems. Afterwards we would go for a walk on darkening beach. I pulled up on Station Road, jumping up onto the kerb in a tight spot between a Mazda and a Mercedes. When we got out of the car we saw immediately above us starlings in murmuration. Not an especially spectacular group, relatively. There were perhaps a few hundred birds, but always, still, mesmerising enough to watch for a few seconds as the flock wheeled and twisted out of sight behind the three-storey houses. There used to be many more–starlings. Their population has declined by, according to the British Trust for Ornithology, by 66% since the 1970s, and is now redlisted as of high concern. I see them now regularly competing in Newcastle city centre with the other ground feeders: the pigeons, crows, blackbirds, for crumbs and detritus. They have always been adaptable; always inhabited, in my experience, coastal habitats. 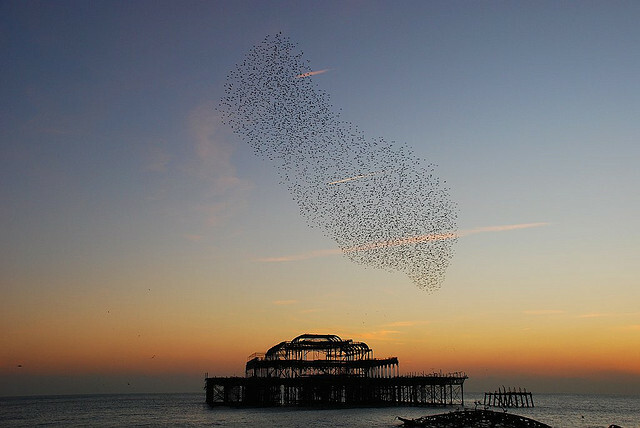 The murmuration in Brighton, where the birds swarmed over the sea to come to rest under the eaves of the piers, the only structures large and open enough to nest their numbers, would draw crowds each night, on good nights at least. Here in Whitley Bay the few hundred murmurated around and above an evergreen tree which, when we returned from our beach walk, and the purchase of an overlocker, a beautiful _and_ productive evening on this 2nd day of the year, lit by th almost full moon, was alive with starlings chattering to each other, sorting their pecking order and perches for the night, the wild, joyous convocation of birds. How else would you be after a hard day seeking food, some still hungry bellies, a bright moon to whistle at, and a home unflustered by all human deeds going on around it, the comings and goings of us not nearly so pretty or fast, our commerce not so pure, although making one’s own clothes is not a bad way to spend a day, nor is standing to listen to the starlings settle, if only for a moment, before we get into the car.